If you've found yourself swooning over beautiful kitchen paint ideas then no doubt you're already raring to go, but finding the best paint for kitchens – or, more specifically, for your kitchen – isn’t just a case of falling in love with a swatch and running out to buy a few litres of your perfect shade. In a room that sees the level of action a kitchen does, it’s imperative that its wall covering can stand up a lot of rigorous use. For bigger kitchens, where not every wall is in close proximity to the hob or the sink, this can mean something as simple as a wipe-clean paint, but if you’re in close quarters, you might want to find something engineered to resist heat and moisture as well as staining. Find the best paint for kitchens, then be inspired by these gorgeous kitchen paint ideas. Use our guide to designing and planning a kitchen to get your new room just right. WHAT IS THE BEST PAINT FOR KITCHENS? What is the best kitchen paint? The paints listed below are specially formulated to suit kitchens. Our top choice, Dulux Easycare Kitchen Matt Emulsion Paint, goes on easily and dries to a wipe-clean finish, making it a great all-round choice, but if you’re after something specifically for ceilings, tiles, or even worktops, keep reading for the rest of our picks. Ensure you choose a kitchen paint that is designed specifically to do the job you want it to. Kitchen wall paints, for example, will be better than living room wall paints at coping with damp conditions, but kitchen wall paints won't be up to the job of coating kitchen cabinets – and looking good long-term. Follow our guide to painting kitchen cabinets to find out how. Matt finishes don't have the wipe-ability that anything with a sheen does, so bear this in mind when choosing where to put which finish. You could, for example, pick a matt colour (if that's a finish you like) on three walls, and one with a mid-sheen on the wall behind the sink/cooking area that's likely to be splashed and need wiping. If you're a messy cook or have children running around with food-covered hands, it's best to opt for a wipeable paint to keep the room looking smart. Light-coloured walls in the kitchen are the easiest way to a light, bright space, but the trade-off is that they show up food stains and other marks far too easily. That’s where our best kitchen paint from Dulux Easycare comes in. Even in Pure Brilliant White, it’s engineered to stay pristine, with a greaseproof formula that resists stains and makes any marks that do appear easier to wipe off. Reviewers found it dried to a brilliantly gleaming but brilliantly tough finish that was washable without colour fading, too. In our opinion, this is the best paint for kitchens, bar none. Updating kitchen tiles along with the paintwork can be a costly endeavour, so if you’d rather not rip out that splashback just because it’s slightly too warm-toned for comfort, why not paint tiles with this refreshing satin tile paint from Ronseal? It takes a while to dry, but reviewers found their patience was amply rewarded with a smooth, even, streak-free finish that looked just like tile, and a waterproof and mould-resistant one, at that. The best paint for kitchen tiles, we think! Suitable for use on walls and ceilings, this matt kitchen paint is available in a whopping 84 shades, and with everything from sweet pastels to cheerful brights, elegant neutrals to heritage shades, there’s no limitation except your creativity. The modern matt finish doesn’t reflect light, so it’s set to look good no matter the aspect, and it’s moisture, grease and stain resistant to stand up to the rigours of a busy kitchen. Reviewers attested to its winning formula, saying it had excellent coverage and kept its colour after washing down. The best paint for kitchens if you're looking for a wide range of colours to choose from. This wall and ceiling paint adds a layer of defence against mould in high-humidity areas like kitchens and bathrooms, and is said to last up to six years, so you won’t have to worry about it again for a while. Reviewers found the formula easy to work with and said that it gave good even coverage on walls and ceilings, with some long-time users coming back to report that it does the job keeping mould at bay too. 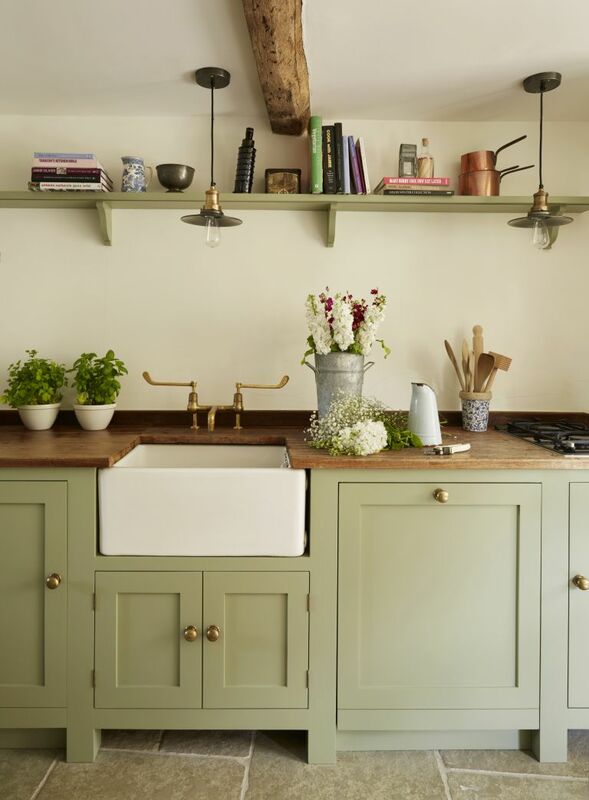 Overall, this is certainly a case of doing exactly what it says on the tin, making it our pick of the best paint for kitchens that often get mould. Even more costly than replacing kitchen tiles, by quite a wide margin, is replacing worktops, so if yours need a bit of an update, it might interest you to know that needn’t mean ripping them out and starting again. Rust-Oleum’s Kitchen Worktop Transformation Kit gives you the option to overhaul laminate worktops for under £70, and while reviewers have noted that you absolutely need to follow the instructions to the letter and work quickly, if you do, you’ll be left with a very impressive finish. So, if you're looking to revamp your surfaces, this is the best paint for kitchen worktops. Love the clean, bright look of white cupboards but not a fan of gloss? Dulux have you and your cabinets covered with this satinwood paint that’s suitable for use on wood and metal. Its low VOC content makes it a little friendlier to work with in small spaces than some more potent paints, and it has a user-friendly formula too: self-undercoating, non-yellowing and wipeable, for when you shake the frying pan with just a little too much Jamie-esque gusto. Our pick of the best paint for kitchens if you're looking for something family-friendly and durable. This low-odour, water-based paint has a formula that’s not just eco-friendly and pleasant to work with, it’s optimised for kitchen and bathroom use too, offering protection against condensation in high-moisture areas. Reviewers loved the consistency, finding it to be creamy rather than watery or sticky, and rated it for how easily it applied and washed out of brushes after use. Its other big hit with users was its unique mid-sheen finish, a subtly lustrous alternative to satin or matt that resists moisture, stains and even greasy marks. The best paint for kitchens if you're after something washable, we think.